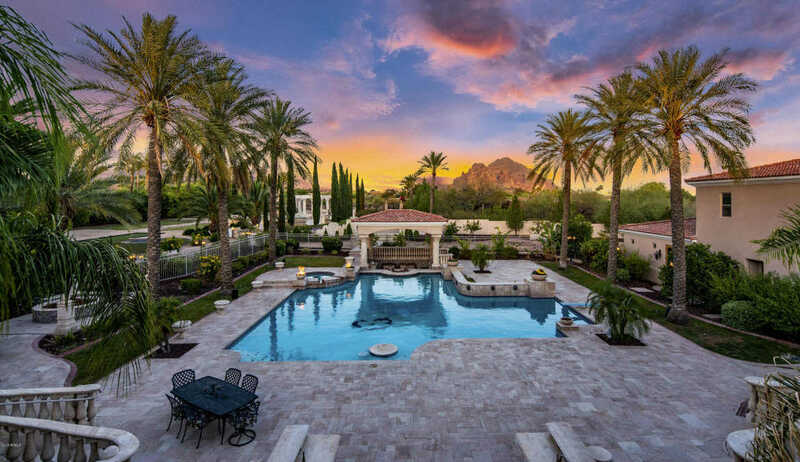 This masterfully designed and privately gated palatial estate is situated on roughly 5 acres of manicured grounds in PV and offers breathtaking views of the world famous Camelback Mountain’s Praying Monk and Piestewa Peak. This majestic one-owner estate underwent a multiple year construction process because of its unrivaled attention to architectural details and handpicked finishes that were inspired from the Versailles in France. From its romanesque water fountains, imported grand staircase, marble fireplace surrounds, polished marble floors, hand carved limestone columns, hand-woven silk wallpapers, coffered ceiling, to gold fixtures and custom cabinetry throughout. click for more supplemental info. I would like to schedule a private showing for this property: MLS# 5780430 – $13,400,000 – 5837 N Palo Cristi Road, Paradise Valley, AZ 85253.